LAS VEGAS (AP) Welcome to Impossible. The Golden Knights are the third franchise in NHL history to clinch a berth in the Stanley Cup Final in its inaugural season, joining the Toronto Arenas in 1918 in the league’s early days, and St. Louis Blues in 1968, when all six expansion teams were in the same division and one of them had to make the final round. Vegas will play either Tampa Bay or Washington on hockey’s biggest stage. The Lightning lead the Eastern Conference final 3-2, but the Capitals host Game 6 on Monday night. Hence, ”The Golden Misfits” tag. 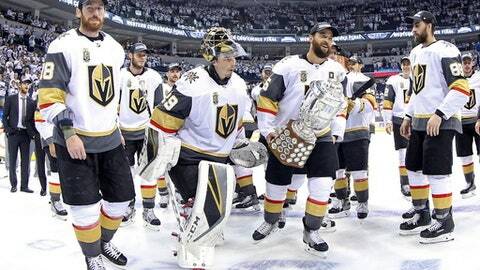 Nobody could have scripted Vegas, a 500-1 long shot at the start of the season, making the playoffs – let alone earning a shot at Lord Stanley’s Cup. It’s a credit to coach Gerard Gallant’s philosophy of having a well-conditioned, confident group of forwards who work well together, focus on short effective shifts, and exude confidence on the ice – all while, as he reiterates it daily, playing 200 feet of hockey. And while the Golden Knights haven’t necessarily been a high-scoring threat, scoring just three or fewer goals in 12 of their 15 playoff games, their defensemen have played exceptional to this point. Vegas has allowed the least amount of goals in the playoffs, among teams that have played 10 games. It was a stifling and disruptive defense that helped propel the Golden Knights past the Jets on Sunday, with their sixth win in eight road games during the postseason. The key cog in Vegas’ engine has been Fleury, whose remarkable play has translated into a career-best postseason. He has allowed two or fewer goals in 10 of 15 playoff games, and is heading to the Stanley Cup final for a third consecutive year. And whether he admits it or not, the 14-year veteran still bears the scars of being left exposed by Pittsburgh last summer after spending the first 13 years of his career with the Penguins. Gallant, who remained coy about his team’s aspirations during the regular season, made it clear the Golden Knights haven’t reached their goal. ”It’s been an awesome ride so far,” said Gallant, who some might also consider a ”misfit” after Florida fired him following a road game at Carolina last season, then left him and his luggage on the curb outside PNC Arena. ”We’re going to the Stanley Cup Final, but again, this isn’t what we want. We want to win.